I have a problem with the appearance of a fraction which has in its numerator another fraction. 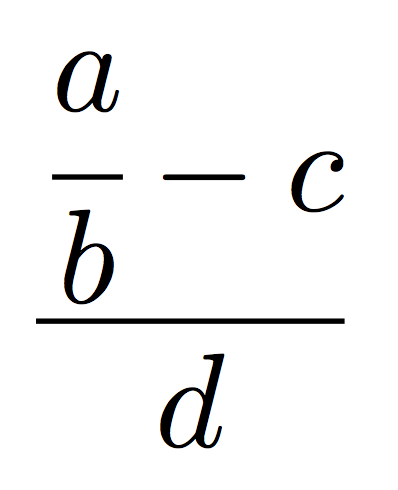 It is not very beautiful as the second fraction is small, even though I use \displaystyle. How can I have both fraction as big as they should be? And why this is happening even though I use \displaystyle? should sort you out. The cfrac macro (from the amsmath package) is for continued fractions. How to vertically center the fraction line? How to get a vertical bar which is the exact size of the object? How to make all parts of fraction, except numerator, disappear while keeping original position of numerator (or how to align at numerator with `&`)? Infinitely shrinking continued fraction - how to improve design? How can I align certain elements of the numerator and denominator in a fraction?